Israel's High Court reached no decision on the fate of 20 Eritreans camped out in the no-man's land between its border and that of Egypt. Israel's High Court has reached no decision on the fate of 20 Eritreans camped out in the no-man's land between its border and that of Egypt. The would-be illegal migrants had attempted last week to enter Israel despite a recent public government campaign to round up and deport Sudanese and other infiltrators who have been running the border over the past several years. 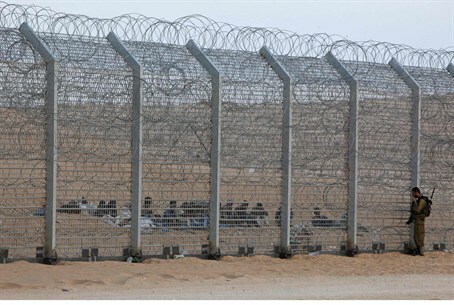 When they encountered the new security fence installed on the southern border, they simply camped out in the area between Israel and Egypt, and waited. The Court, which has been mulling a petition to allow the entry of the would-be illegals and subsequent applications for political asylum, instead chose to adjourn the matter till Sunday. The State, which responded to the initial petition by noting that Israel has “the right to decide who is allowed to come through its gates, and as such is allowed to construct a fence separating it from Egypt,” was asked the present an updated position by the next hearing. Presiding over the hearing were Supreme Court President Justice Asher Grunis, Judge Neal Hendel, and Judge Hanan Meltzer. The leftist Israeli NGO “We Are Refugees” which appealed on their behalf to Israel's High Court, demanding the would-be illegal migrants be allowed to enter the country and apply for political asylum, posted a passionate statement on its Facebook page appealing for public support. "Twenty African asylum seekers have been trapped between the fences on the Israel-Egypt border since last Thursday," the statement said. The NGO claimed in its petition to the court that the area between the two fences is technically within the sovereign borders of the State of Israel – thus forcing the Jewish State to accept responsibility for the lives of the would-be migrants. Israel, however, insisted that Egypt is responsible for absorbing the asylum seekers since that is the country from which they set forth towards Israel, and pointed out that they are in no danger there. IDF soldiers provided both food and water to the would-be illegals through the fence, reporters noted. Israel's Interior Ministry said in a statement Wednesday that it has no legal obligation to let them in, noting, “There has been no determination by any international body according to which Sudanese or Eritrean citizens are persecuted in Egypt or that their lives are in danger. Therefore, there is no legal obligation to allow entry into Israel of those who are near the fence." Tens of thousands of illegal African migrants have entered the country over the past several years, flooding Israel's cities and wreaking havoc with carefully planned social services programming funded with meager municipal budgets.